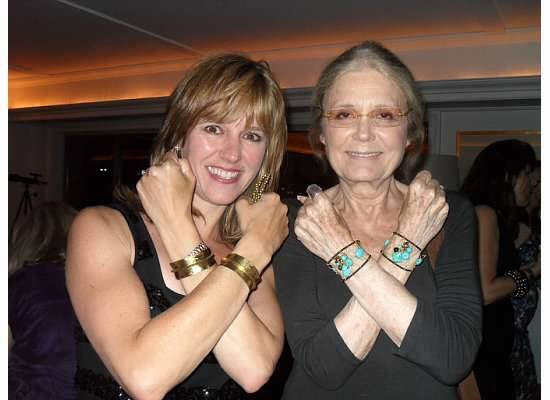 Yesterday was Gloria Steinem’s 79th birthday. Looking at the picture below, taken just 2 1/2 years ago at my ‘leaving New York party’, one might say – NOT POSSIBLE! Gloria is truly one of the most spectacular human beings I have ever known and she is a constant source of inspiration to me. Click here for a great article by Jessica Wakeman ( Hi Jessica ) on 15 Things to Know About Gloria, and I am adding one below! As many of you know I collect Wonder Woman paraphernalia and I am a huge fan. It just so happens that Gloria is one of the world’s experts on Wonder Woman. The cuffs you see me wearing were a gift from Gloria and truly, one of most special gifts I have ever received. Next Post Do Women on Wall Street Help Other Women?